A mathematical model of mass transfer from lamina (plant leaf) into the extractant is constructed considering its anatomical organization in particular the existence of cellular and intercellular space. Its solution allows to predict kinetics of the extraction process of the whole leaves at its implementation in practice. Akselrud G. and Lisjansky V.: Extragirovanie (Systema Tverdoe Telo – Zhydkost). Khimiya, Leningrad 1974. Dyachok V.: Chem. & Chеm. Techn., 2010, 4, 163. 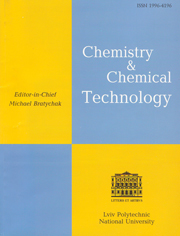 Dyachok V., Malovanyy M. and Ilkiv I.: Chem. & Chem. Techn., 2011, 5, 163. Dyachok V. and Ilkiv I.: Chem. & Chem. Techn., 2013, 7, 23. Hopkins W.: Introduction to Plant Physiology, 2nd edn. John Wiley&Sons, New York 1999. Rice R., Nadler K. and Knoff F.: Chem. Eng. Commun., 1983, 21, 55. Dyachok V.: Pharmacevtychniy Zh., 1998, 3, 69.